The Door Industry Journal: Have you checked the post? Printed copies of our Spring Issue are on the way! Have you checked the post? Printed copies of our Spring Issue are on the way! You’ve probably noticed we have a new logo on the cover, which is something we’ve been developing for a while and is designed to reflect what most people know us as – simply the DIJ – with a strapline of our official name. We’re very happy with the bold, high-impact design and this will be followed soon by a new website and blog. Elsewhere in the magazine there’s plenty to keep you interested over the Easter break. 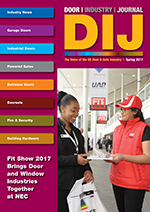 On page 6, you’ll find our lead story about the FIT show, which has now moved to the NEC to cope with its expansion. This is a consequence of what was once a windows-only event becoming one for both windows and doors and creating a synergy of both sectors. 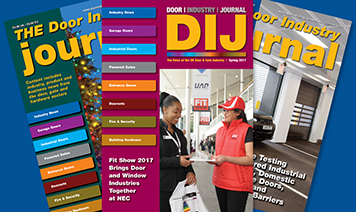 On page 21, meanwhile, we present our new column – Salutary Tales – that reports on door and gate-related incidents with unfortunate consequences, some of which led to court cases. The column is written by John Boydell - a door industry consultant and forensic engineer. Also of interest is Theuns Liebenberg from Sommer on page 54, where he explains the process of complying with CPR and Supply of Machinery Directives when installing garage doors and openers from different manufacturers. There’s more good advice on page 100, where Tim Almond from Assa Abloy Security Solutions talks about ‘Defining and Meeting PAS 24 Compliance’ and counters the confusion surrounding what PAS 24 compliance actually means. I’m sure you’ll also be interested in what Stewart Phillips - MD of Alugate UK – has to say on page 84, where he introduces their new Alutrend aluminium gates range. These new gates have a distinct advantage over others, as they are welded together as opposed to being of sectional construction.